In my first post about resource management, I argued that the original rules for resource management in D&D are too difficult, that they're rarely used, that they nevertheless saddle us with a legacy of unnecessary bookkeeping, and that a better solution is to truly ignore resources that you don't plan to meaningfully track. A longer-term goal of this project is to think about solutions, about better ways to track resources so that they can be managed, easily, effectively, and at the table. There are a number of creative solutions that have emerged from the OSR that deserve to be looked at in detail. In the shorter term, I want to take a step back and define what I mean by "resource management" generally, identify the major resources that there are to manage, and talk about what I think RM gaming looks like compared to non-RM gaming (and perhaps, compared to an emerging genre of new-RM gaming). I don't think I have any original insights here. I'm just collecting my own thoughts in one place. I only have the same intellectual resources anyone reading this blog has available to them: access to the rulebooks, and the wealth of play reports and session reports that let me read what other players and other judges do in their games. I'm not even making a real systematic analysis of those reports, just using what I've seen to inform general impressions of common ways that people play. By resource management, I mean the minigame of actively tracking the supply of multiple different kinds of resources, making decisions (both short-term tactical and long-term strategic) to manage the rate at which the supplies of these resources are depleted and replenished, making trade-offs to spend one resource in order preserve another, and suffering consequences or receiving rewards for making these decisions poorly or well. The resource management within a play-style or campaign can vary in at least three ways. Campaigns can differ in the purpose that resource management serves within the game, in the overall importance of resource management to the campaign, and in the method used to track each resource. I think of these as being semi-independent axes; two different judges might both use the same method to track a given resource, but it might be much more important in one campaign than in the other, and the purpose that managing that resource serves might be quite different. On the other hand, I have the impression that people's answers to these questions tend to cluster to form either "resource-management games" (or "high-RM games", if you prefer) or "non-resource-management" games. Purpose - Resource management can be a source of active danger in a campaign. In such a game, players are always at risk of running out of something mid-session, and if they do, there are mechanical consequences. There is an expectation that the players will run out of supplies sometimes, and so the consequences, while possibly harsh, are generally non-lethal. (For example, if players are exploring a pitch black cave using headlamps, they would need to continuously monitor the battery life of their headlamps. They might rotate leaving some on and some off, or turn them all out while camping to save power. If they run out of batteries entirely, they'll have to navigate the cave in the dark. This is much harder than navigating with lights, and increases their chances of becoming lost or trapped, but they also might still make it out alive, especially if they have a good mental map or a skilled navigator. The players could probably spend an entire session exploring the cave while blind, although this might be a frustrating experience for both them and the judge.) To serve this purpose, the resource in question has to be something that's important and consumable, but not entirely indispensable. A character with enough hp (or other resources) should be able to finish the adventure, or at least rush back to safety, without dying. RM can also serve to set the context for an adventure. Here the assumption is that ensuring that resources don't run out is one of the players' primary goals for the session; there might be rules for the consequences of running out of supplies, but if so, they're typically so harsh that suffering them for more than a couple rounds is going to be fatal. Alternatively, the judge might rule the the players can't take any action that would cause them to run out of supplies, or that they die instantly if they do. (For example, if the players are exploring underwater, they need diving suits and oxygen tanks before ever going underwater. The judge might have rules for drowning, but if so, they'll only get used if someone gets a nick in their airhose during combat, or fumbles while switching their oxygen tanks. There's no way anyone could do the whole dive while drowning the whole time, no matter how many hit points they have. Alternatively, the judge might simply rule that the players have to surface rather than let themselves run out of oxygen, or that they die instantly if they run out.) To serve this purpose, the resource in question has to be something that's vital, and that with careful play is not likely to be used up. Any kind of survival gear for harsh conditions could serve this purpose. A horse or guide might also serve this purpose, with their hit points or morale being the resource that has to be conserved. Resource management could be entirely a downtime activity. Here the assumption is that resources will not run out during play, and that the players don't particularly need to do anything special to avoid it. There are likely no rules about what happens if the character actually do run out of something, and no expectation that such rules would ever be enforced. Here, resource management is essentially reduced to the role of mandatory shopping. It becomes a kind of between-session tax that the judge enforces on the players. Each time they set out, they need to buy new rations, torches, arrows, and anything else that might get used - under the assumption that it likely got used up between adventures and now needs to be replenished. 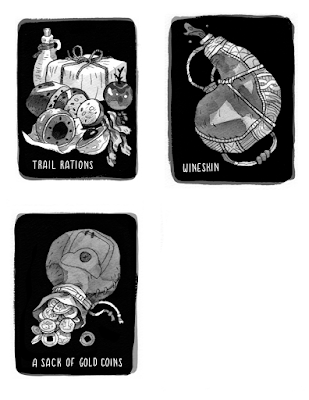 Depending on the prices characters have to pay relative to the treasure they're likely to find, this tax could force them to pick and choose which resources they're going to maintain from adventure to adventure, keep them hungry for their next score, or shade into ritualistic bookkeeping. Any resource that's routinely available in very large quantities could fall into this purpose. RM could also take the form of pure ritualism. Players track their supplies with varying attentiveness; some monitoring every expenditure, others keeping track only when they remember, others ignoring it except when prodded. There are no in-game consequences either way. Details that have no relevance in play are listed in the rulebooks, where they can be dutifully recorded by players who feel obligated to write down such information. It feels weird, or wrong, or strange to consider not tracking some resources at all, across the board. Such is the power of tradition, such is the power of legacy. The actions, once performed for a reason, are now simply performed for the sake of the performance, for the sake of ritual. Any resource that serves primarily as a quantified version of "fluff" or characterization has become ritualized. There's space to write it on the character sheet, but this information is never consulted during play. Finally, resource management could be absent from the game entirely. There isn't space to write it on the character sheet; isn't there in the rulebook to be copied down. Since everything that isn't there technically falls into this category, but the only resources that are likely to be considered notable in their absence are ones that are recorded in other games. The Sims computer game tracks every characters' bladder capacity and Fatal famously tracks a number of different genital measurements; D&D fortunately doesn't, and few players are likely to miss them in their absence - but to consider removing gp, hp, or XP might seem like something that would change the game so much it wouldn't be D&D anymore. And yet, there are those who say the same (loudly, angrily, and often) about resources like loyalty, morale, and strictly-observed movement rates. Hit points, incidentally, can fall into any of the above categories, depending on how many hp characters have, how much damage hazards and monsters deal, how easily hit points can be recovered through mid-session healing, and how the rules around dying are handled. Numbered in the hundreds and backed by healing surges, death saves, and similar mechanics, hit points become something that are tracked more as a ritual or a legacy than because there is any chance of falling to 0 and actually dying. Importance - Resource management can range from being so important that tracking various resources practically is the game being played (as in at least some of those early OD&D games, in Torchbearer, and in LotFP's The God that Crawls module) to basically having little or no role in a game that's mostly about combat, mystery-solving, social interaction, or exploration. In between those poles are play-styles where a smaller amount of resource management is used to set limits on how much combat, how much exploration, etc, can be accomplished, so that tracking resource use is done in service of facilitating some other player goal, rather than being a goal, unto itself. In principle, the importance of each resource can vary independently, but it seems that in practice, these things cluster together, so that either resource management is considered very important and lots of different resources are tracked, or it's considered pretty unimportant and few if any resources are monitored. One challenge in all this is that there's a kind of paradox to resource management. A situation where the players treat resources as important and plan ahead to have a sufficient supply is almost indistinguishable from a situation where the players and the judge all ignore resource management completely. In both situations, resources don't matter. In both situations, play proceeds without complications created by resource management. There's very little difference between play where the players track their resources but always have enough, play where the judge describes the characters using up un-tracked resources and they always have enough, and play where resource use isn't mentioned at all. I suppose the amount of work put into describing unimportant resources creates a kind of sliding scale of gritty realism, but if all you want is flavor, I think it's better to get it from the narrative you speak aloud to each other, rather than the math you scribble silently on the sheet in front of you. Resources don't matter when you always have enough of them. The two situations where resources are truly important are when resources run out and players face the consequences or when resources could run out and players adjust their behavior to ensure the they don't. Spells and hit points make paradigmatic examples for thinking about both situations. Spells run out. Players might occasionally hold back from using a spell to save it for later, but in general, players cast spells when they need them, and then deal with the consequences of no longer having them later. The situation where you used to have a spell that could help you, but now you don't, and so now you have to think of a different solution is inherently an interesting situation. It demands improvisation and creative thinking. Hit points could run out. Nothing interesting happens if hit points do actually run out. You're just dead, just no longer in the game (temporarily). But the things players do to avoid running out of hit points, the way they change their behavior from what they want to do to what they have to do to survive, that is interesting. Negotiations, surrenders, chases, combat-avoidance strategies, all of them happen because hit points could run out and players want to ensure that they don't. A challenge then, for a judge who wants resource management to be important, is to think of why players who care about resources wouldn't just bring enough of them that they don't need to be managed. If you want resources to be important, you can't allow them to be simply a downtime activity, a ritual, or something that's absent from play. Encumbrance is one answer. The characters don't bring enough resources because they can't, they can't carry that much bulk or weight, at least not without the added inconvenience of pack animals and hirelings. The other main answer I've seen is unpredictable resource loss. If resources are consumed at an unpredictable rate, then it may be impossible to have enough of them on hand when you need them. As I'll talk about next time, rations and torches get used at predictable rates, spells and hit points are used up unpredictably. I don't think it's a coincidence that the resources that survive even in most non-RM games are the ones like spells and hit points that almost always matter, that almost always demand to be managed. One final solution is to treat resources as optional benefits. Nothing bad happens if you don't have resources, but something good might happen if you do. 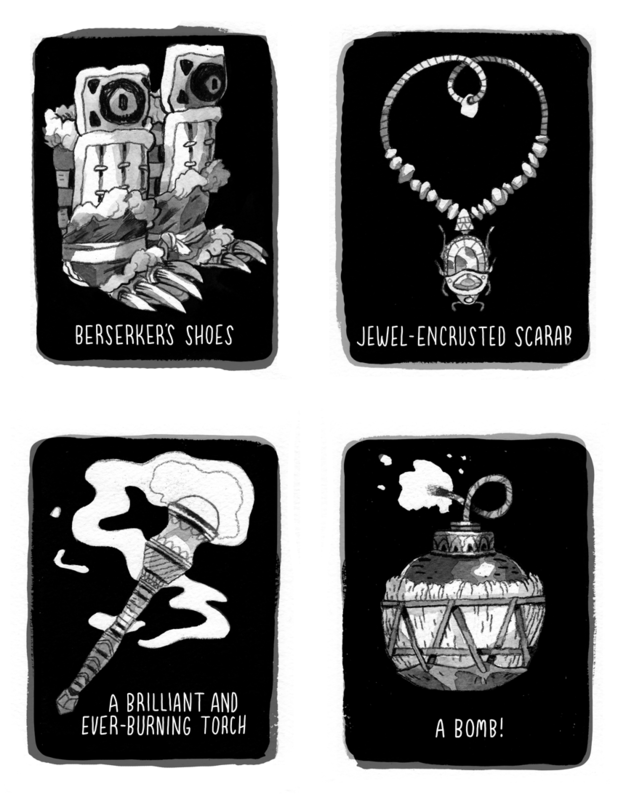 Magic items are like this. So would be, for example, gourmet meals, in a game where you assume you always have enough food to avoid starvation, but gain some optional benefit if you manage to eat a really good meal. Method - Resources can be tracked by counting them directly, by not tracking them at all, or by using an alternate mechanic to track them abstractly. The original D&D rules seem to me to encourage managing all resources by tracking them directly; not tracking, or allowing unlimited supply, seems to me the most direct alternative to that system. Between these two poles, there are a variety of experimental mechanics that have been written to try to track resources at some level of abstraction, typically with the goal of making them more important by making them easier to track. A great deal of innovation in the OSR concerns resource management, and coming up with alternate mechanics for tracking resources while making tracking easier than direct counting. Different resources within the same game can use different mechanics, some resources might be counted, others ignored, the remainder might draw on multiple different sub-systems to track each in their own way. Hit points, gold pieces, and experience points seem to be the most common resources to count directly, even in games that treat other resources differently. Encumbrance, ammunition, and time (especially as it relates to light and wandering monsters) seem to be prime contenders for the choice to either ignore the resource or find a new way to track it. One of my goals for starting this series in the first place was to look at the different systems OSR authors have designed for alternative resource tracking. Great, and thoughtful post. You’ve got me thinking about how directly attacking resources (besides HP) is a recurring theme of early D&D. 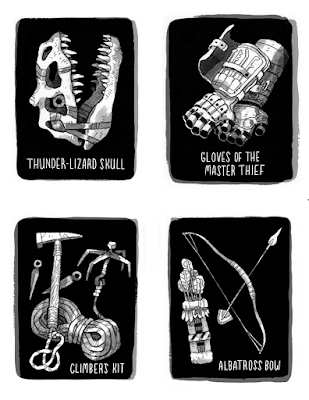 Several of the original D&D monsters were threats to the characters' resources. 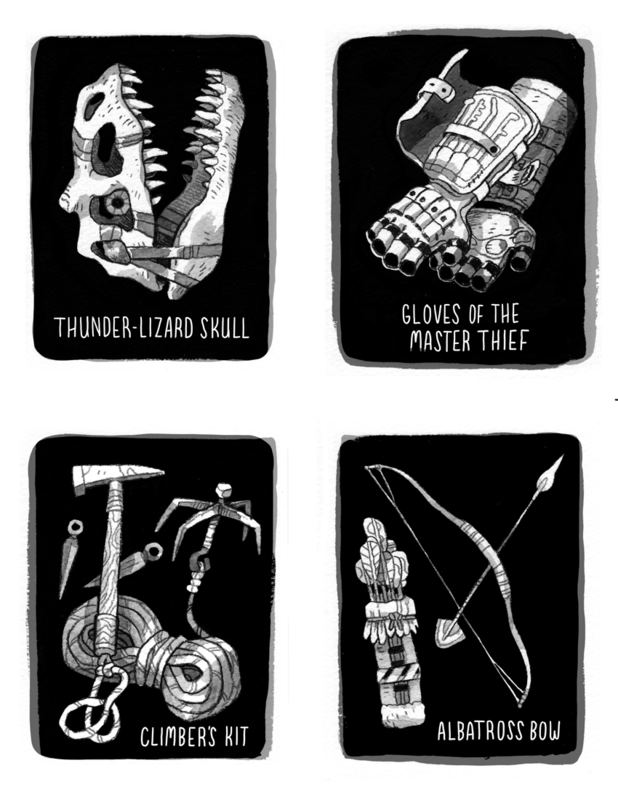 The big one is of course the “Rust Monster”, but creatures like the “Black Pudding” could also ruin equipment. One of the frequently overlooked tables in the 1st edition AD&D Dungeon Master’s Guide is the “Saving Throw Matrix for Magical and Non-Magical Items” (page 80). The DM was supposed to do things that could potentially destroy the resources of even the most well-equipped party, so even high-level PCs dripping with magic items would always be in danger of losing vital resources. That’s definitely a play-style that modern editions of D&D (and modern RPGs in general) either don’t support, or actively discourage. Good points, Daniel. Having some monsters attack resources would work to make even a well-planned mission feel more precarious. Really liking this series, especially your idea of the paradox of resource management. Fits with a lot of recent thinking I've been doing on why resource management in Torchbearer wasn't creating tension. I think my players were just so well prepared and well stocked that the resource management might as well not have existed. Now that I've moved my campaign over to Into the Odd, I'm thinking about how I'd like to manage resources, or if I should even manage them at all. Looking forward to your next post in this series. Good post. I have often struggled with resource management in ADnD. After the first few sessions of good intentions it always seemed to slip by the wayside. Then I'd give in and hand wave it with a Bag of Holding or two. I did however use the Item Saving Throw matrix religiously. Losing valued magic items hurt more than HP.!! !